Words are powerful. They can encourage, inspire, and help us to believe in ourselves. So why not put those words on a Christmas Ornament where they can be seen over and over. 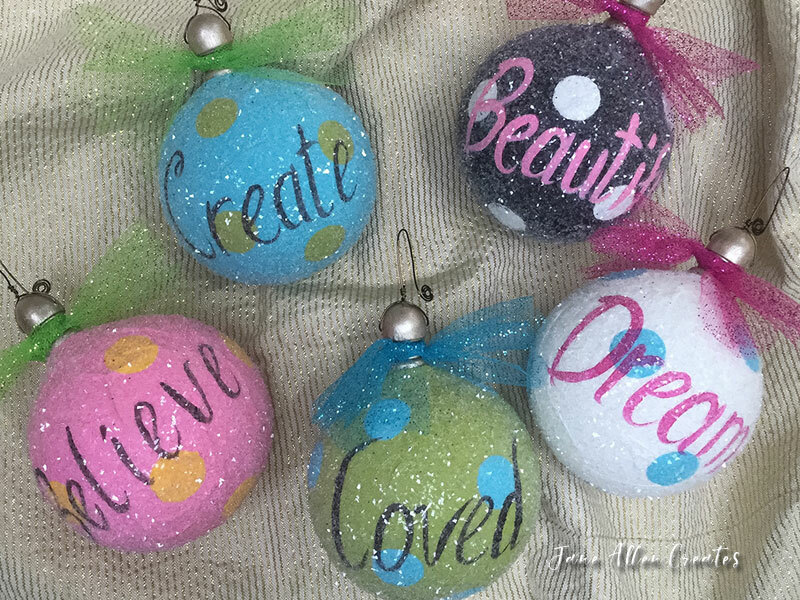 To make these ornaments I started with a paper mache 4″ ball ornament. You could use the ornament as it is, but I decided to make mine a little fancier by adding a finial. Drill a hole in the finial so that you can attach a wire hanger. Also drill a hole the size of the bottom of the finial in the paper mache ball. You could attach the finial with glue, but I choose to use Quikwood in order to have a nice finished edge. Now for the fun. Paint the balls any color you would like and paint on dots using a 3/4″ dauber. Notice that an egg carton makes it easy to hold them while they dry. Paint your finial using your favorite metallic color. Freehand on your words using a complementary color. Think about what would be the perfect word of encouragement for the person who will receive each ornament. Next you will want to add glitter, so first slip a wire into the hole in the finial so the ornament can hang while drying. Holding by finial, spread white glue over ornament using a sponge brush. Sprinkle with glitter and hang to dry. I used glass glitter on my ornaments because I like the extra sparkle. When done I added a little bow of glittered toile. Now think of all the people in your life that you can inspire with your words and start creating. I hope you enjoy creating these ornaments. It would be a great project to do with a teen to give to their friends. I love how you add glass glitter to your projects. Much nicer than ordinary glitter. Thank you Effie, the extra sparkle is worth it.